Well folks, A good friend of mine just scared the crap out of me with a link he sent. Being the curious type I followed it and read about a plan our country has formulated to send millions of people from the USA to countries like Brazil, Australia, Argentina, and South Africa. Why? That is my questions these days. 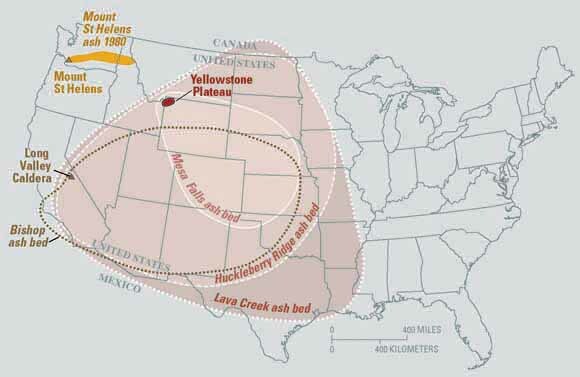 According to Geo-physicists Yellowstone Park is due to blow up any second, day, year, or millennium. They don’t really know is what they are saying. What they do see, however, is animals leaving Yellowstone. In their minds this is an indicator of a man-made global warming disaster in the works. The man-made global warming thingy is mine not theirs. I’m surprised that ALGORE has not used this as another super scare tactic to sell his carbon credit scheme to the world. One of the funniest things in the article is that South Africa rejects the idea of accepting so many white people into their country because it would upset their culture. I guess they need some Progressives to teach them about the benefits of diversity. I wish I would have been on the line with that caller, I would have suggested we send only black people back to South Africa. I wonder if that would have changed their minds. The map above shows the predicted area that a volcanic eruption will cover. Good bye western states, when Yellowstone goes so do you. The article I read doesn’t explain what the effect will be it merely describes people being shipped to far away places. My question is which people? Those under ash, or those in the Eastern USA who might have survived? Notice how the effect of the volcano conveniently stops along our border with Mexico. Most likely that is because the Mexicans enforce their laws allowing US Citizens into their country. No where in any of these links did I read about how the government would find and transport millions of people to new countries. How many airplanes would it take? How many flights? Would there be any airports or docks from which transport could take place? Perhaps they would prevail upon Russell Crowe to build an Ark to transport our sorry asses to Australia. Would they ship Conservatives or Progressives, or both? Would the IRS be involved? Will the big boom end all NSA spying inn us? Another link in the article took me to a book called “Ashfall” by Mike Mullin. This story takes place after the big boom, and is one I have to read. It is in the “scare the hell out of young people” genre like Divergent and Hunger Games, but, I am old, why is it scaring the hell out of me? After absorbing all of this stuff, I decided my goal to bash Obama is for naught because in a another second, minute, year or millennium, we, meaning him and me, will be digging out of the ash and there will be no wealth left to redistribute. EXCEPT, the Pope has some new news for us Catholics. He has asked the UN to consider turning the world into a Marxist state so all the poor can partake in the wealth. Not only will I die in the ash, my soul will roast in hell. My world is crumbling. All I can say is THANKS Rich, you made my day.